In any marketing automation tool, every campaign is configured on the basis of segments you create. The simplest way to go about launching any campaign is analysing user behavior, creating different set of behavior based user buckets and running campaigns. Segmentation enables you to define a bucket template where all the users with similar characteristics and attributes can be found. Let’s say, you would like to create a segment of female users, aged 29, are from New York, have added Hair Shampoo and Hair Brush in their cart in the Android App. Attributes: These are user properties that further help in filtering out the users in the segment. These could be anything as per your Event Configuration, such as First Name, Last Name, Gender, Age, Channel. We will choose Gender here. Operator helps in pinpointing the chosen property. We will choose Equals and enter value as Female. The + sign enables the addition of other properties to filter out more users. Let’s select Age in properties, select Equals operator and enter value as 29. Geo-targeting: Select the location as New Delhi. 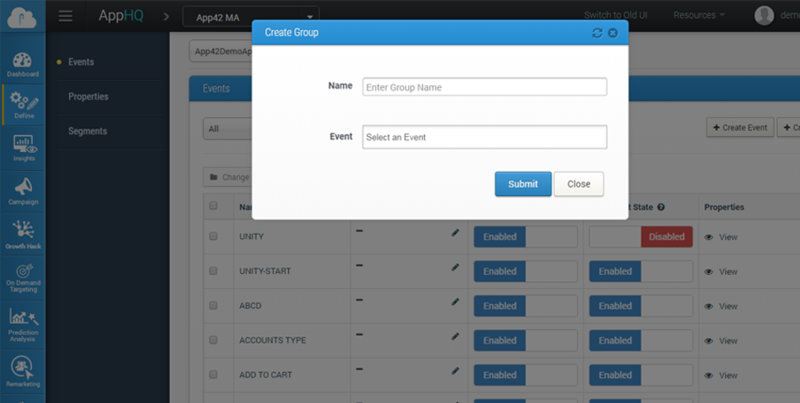 Choose the event as Add to Cart, here the operator means occurrence—select greater than equals to and add value as 1. This would mean any user who has added any item in the cart at least once will be targeted. In the property, choose product and in the operator (here this means the value that will be associated with the property) select Contains and enter value as Hair Shampoo. This would mean all users would be targeted who have added any shampoo in their cart. Click on + to expand and select AND. Repeat the above step and add the value in the property as Hair Brush. In the Android Section, select property as per your specifications and click on Submit. Similarly, you can create segmentations as per requirement targeting users on any of the channels among Android, iOS, Windows, Web and others.